For those of you who are not meeting your daily recommended servings of vegetables, you can now have your vegetable for dessert. 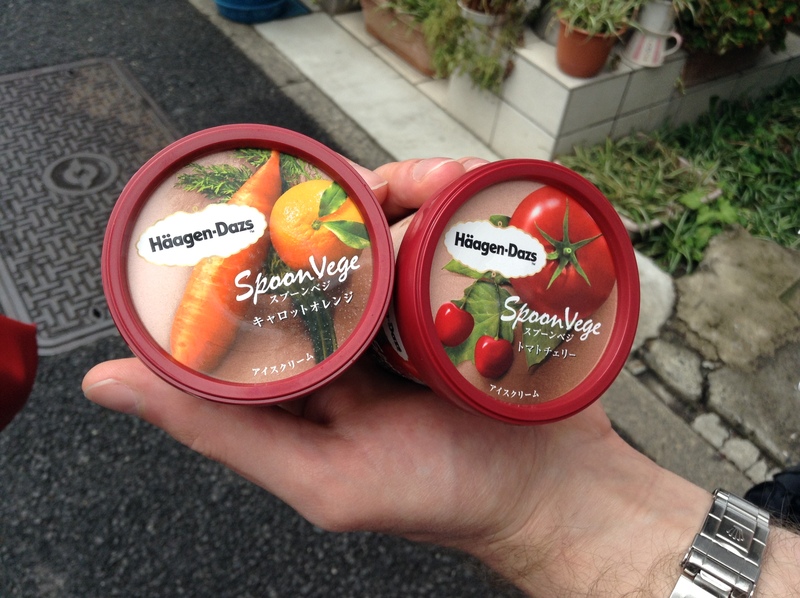 The Haagen-Dazs SpoonVege comes in two flavors, Carrot and Orange or Tomato and Cherry. I tried it with two friends so we could all share our thoughts. The Carrot and Orange reminded us of a Creamsicle®, fruity and creamy and shared that same orange color. It was good but not great. Same with the Tomato and Cherry. One friend said later in an e-mail that she thought it didn’t work out as it was cream based. I agree. Both of these could have been interesting had they been created in a sorbet style. We threw these away after we all took a spoonful. My recommendation? Buy one and see if you like it. If you do, go ahead and try the other. Better yet, stick with what they do well, flavors like Melty Caramel or Green Tea (a rich mattcha). In Japan you often come across flavors not available back home, so if you are visiting Japan, be on the look out for for Haagen-Dazs mini cups at convenience stores and supermarkets. Be sure to ask the cashier for spoons which they often keep at the check-out counter. My suggestion? Stick with the vegetable ice cream flavors you are already doing a great job with, kabocha and purple sweet potato. Maybe bring those back with this new packaging.